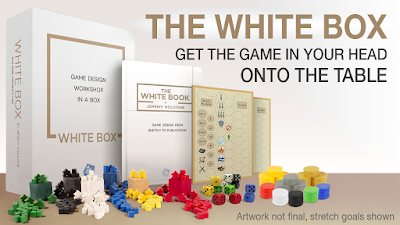 The White Box is a game design workshop-in-a-box. It contains a book of essays and a whole bunch of prototyping pieces to help you get the game ideas out of your head and onto the table. The White Box is Kickstarting right now. We're producing it in cooperation with creator Jeremy Holcomb and our friends at Gameplaywright. The White Box will ship in October, in time for holiday gifting. If you're the kind of person who thinks game design is awesome — or if you know someone who is — have a look! Quite original... & on par with Atlas' high standards! What if I don't want/need all the bits, but am interested in a physical copy of the book? Physical copies of the book are only available along with the bits, I'm afraid. You can get digital copies separately (PDF, epub, Kindle, and audio), but not physical ones. When speaking of online games, these are certainly considered as one of the best past time for them. There are thousands of old and young people of all age group who like to play hulk games online. Internet certainly does offer you with wide variations of generator vbucks and you can try and perform a simple online search for some of the latest additions. The "Wikipedia problem" which means children turning to internet for readymade answers is the new age phenomenon baffling teachers and mentors globally. There are almost equal numbers of teachers who consider technology to be a solution as much as a problem. While a common belief is that technology is hindering the students' capacity to think and analyze, there is also a strong opinion in favor of video games and digital gadgets' ability to engage students and enhance learning by using more than one sensory stimulators. In spite of the growing concern about the students' deteriorating attention spans, institutions are incorporating them in the process more info classroom learning. Gamers know that there is no reassure or other sort of gaming gadget visit this site right here, that can really beat the execution a work area can bring. There are limitless types of card games to be played. People think because two games use the same deck of 52-cards that they are similar games, unblocked games but nothing could be more different than Barbu and Speed, or Pai Gow and Pinochle.